Over the centuries more editions of Euclid's Elements have been produced than any other book except for the Bible. In 1847 a new and radically different edition of the first six books of this important work was published by Oliver Byrne. 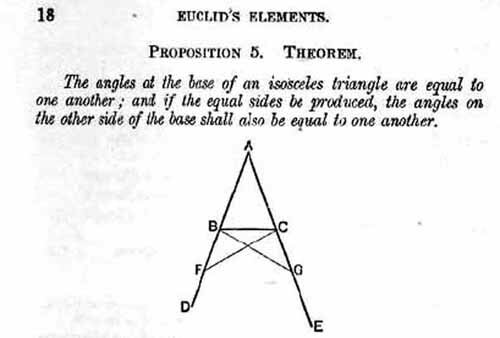 ... the 'Elements' of Euclid can be acquired in less than one third of the time usually employed and the retention by the memory is much more permanent; these facts have been ascertained by numerous experiments by the inventor, and several others who have adopted his plans. 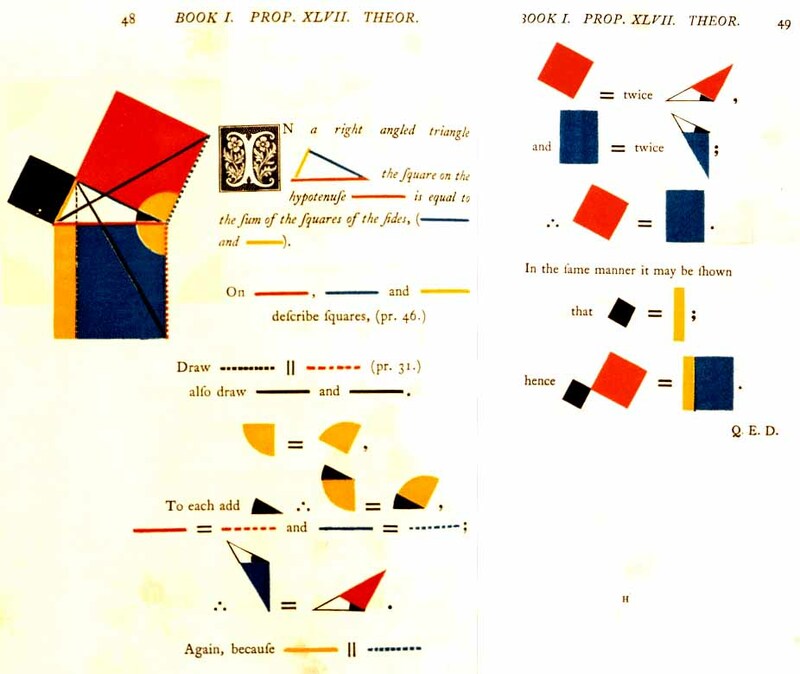 Byrne describes his edition as one: in which coloured diagrams and symbols are used instead of letters for the greater ease of learners. His novel idea was to replace the usual symbols for lines, triangles, angles, ... like AB, ABC, ∠ABC, ... by coloured shapes. He had four colours (including black) at his disposal and so a line became a coloured segment: , a triangle a set of (vari-coloured) lines, an angle a solid coloured shape like and so on. Then, in the version of the proof of a given proposition, the various geometric entities were represented by symbols corresponding to parts of the original diagram. Byrne believed that referring to geometric entities via a labelling like A B C ... obscured the essentials of a proof and made it harder to understand and remember. One first constructs AF = FG and then proves the congruence of the triangles AFC and AGB and then of BCG and CBF. 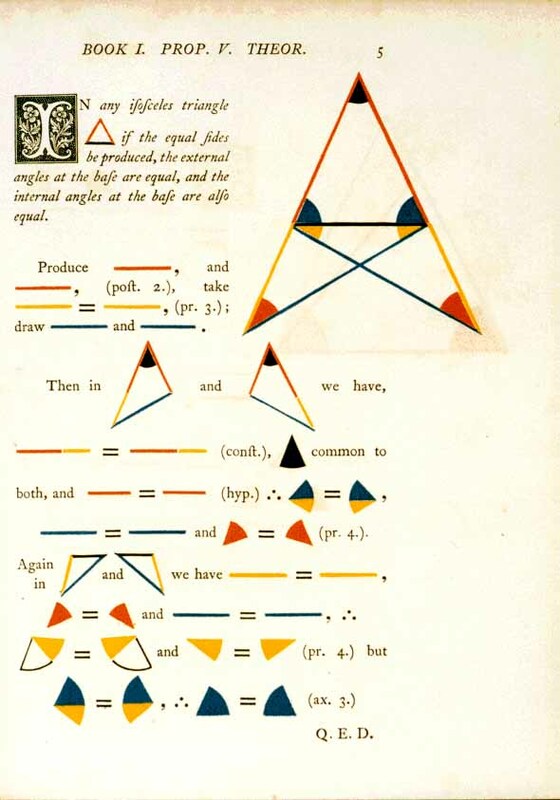 ... the use of coloured symbols, signs, and diagrams in the linear arts and science renders the process of reasoning more precise, and the attainment more expeditious. 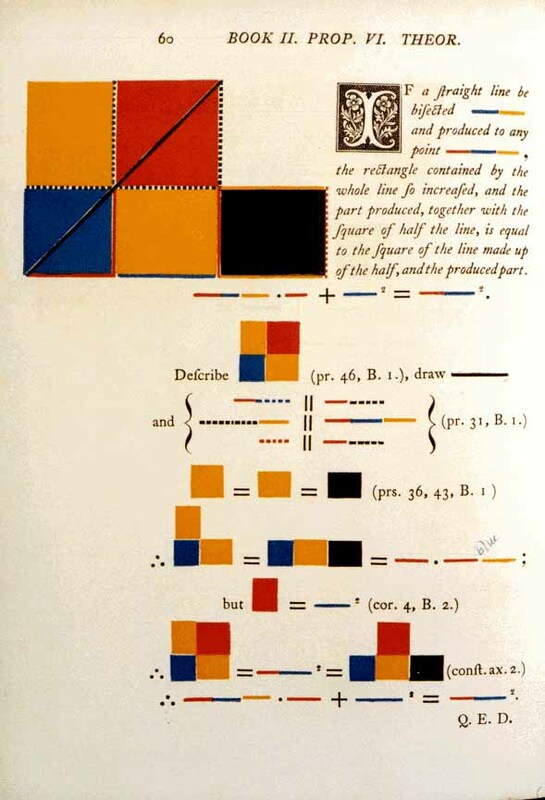 See, for example, how in the proof of Pythagoras's Theorem (Book I, Propn XLVII) the resulting working becomes a very attractive riot of colour. Our object in this place being to introduce the system rather than to teach any particular set of propositions, we have therefore selected the foregoing out of the regular course. For schools and other public places of instruction, dyed chalks will answer to describe diagrams, &c. for private use coloured pencils will be found very convenient. There were, however, severe difficulties in implementing this approach. Not the least was the difficulty of accurate colour printing. In the 1840s this was a rarity and Byrne was lucky to find a publisher who was prepared to take on the task. He found William Pickering, who, with the assistance of the type-setter Charles Whittingham, produced a masterly version of Byrne's vision. The production included decorated capitals similar to those in mediaeval illustrated manuscripts. The Elements really did seem to be like a copy of the Bible! Alas, such a production was bound to be expensive. The volume cost 25 shillings at a time when a comparable edition in black and white would have been about 2 shillings. Consequently sales were limited and in the end the printers were left with about 75% of the print run. In fact the production costs of this work (and similar high-class examples of elaborate printing) contributed to the bankruptcy of Pickering a few years later. This means that only a few copies of Byrne's work found their way into circulation and hence, by the peculiar irony of the second-hand book trade, those that did are now extremely valuable. Of course this meant that Byrne's dream of seeing his method replacing the usual way of presenting Euclid was never going to be realised. So from the point of view of the history of mathematics, Byrne's efforts were something of a cul de sac. Cajori, writing eighty years later, dismissed the work as "a curiosity" and echoed the poor opinion that De Morgan had expressed a couple of years after its publication. However, Ruari McLean, writing in Victorian Book Design and Colour Printing (University of California, 1972) calls it "one of the oddest and most beautiful books of the whole century". 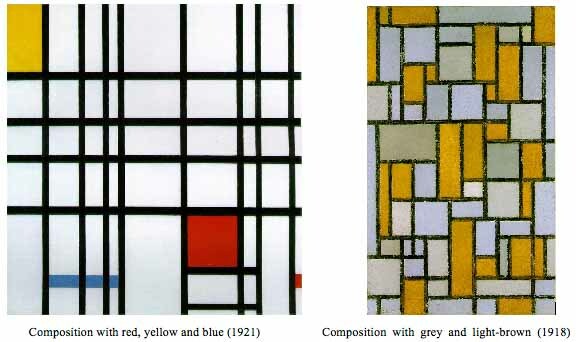 Historians of art have seen the geometric works of Mondrian pre-figured in the diagrams devised by Byrne  though Mondrian admitted to never having seen the work! It is easy to leaf through the volume with its curious long s's and beautifully decorated capitals and appreciate the work as a fine work of design rather that as a mathematical text. If a straight line be bisected and produced to any point, the rectangle contained by the whole line so increased, and the part produced, together with the square of half the line, is equal to the square of the line made up of the half, and the produced part. Oliver Byrne, The first six books of the Elements of Euclid: Facsimile of the 1847 edition: with explanatory booklet, Taschen GmbH, 2010.